ASTM A194 Standard Specification for Carbon and Alloy Steel Nuts for Bolts for High Pressure and High Temperature Service. This specification covers a variety of carbon and alloy steel nuts. These steel nuts are used with A 325 Bolts. Hughes Brothers uses Grade 2H. ASTM A307 Standard Specification for Carbon Steel Bolts and Studs, 60,000 PSI Tensile Strength This specification covers the chemical and mechanical requirements of two grades of carbon steel bolts and studs in sizes 1/4 inch through 4 inch. 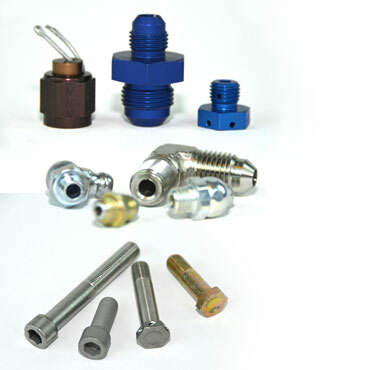 Grade A bolts are used for general applications. ASTM A325 Standard Specification for High-Strength Bolts for Structural Steel Joints This specification covers the chemical and mechanical requirements of various types of quenched and tempered steel bolts commonly known as “high strength structural bolts,” intended for use in structural joints. Type 1, Bolts made of medium carbon steel. Type 3, Bolts having atmospheric corrosion resistance. ASTM A394 Standard Specification for Zinc Coated Steel Transmission Tower Bolts This specification covers the chemical and mechanical requirements of hexagon and squarehead zinc coated steel bolts and atmospheric corrosion resistant bolts in nominal thread diameters of 1/2, 5/8, 3/4, 7/8 and 1 inch for use in the construction of transmission towers, substations, and similar steel structures. Type 0: Zinc coated bolts made of low or medium carbon steel. Type 3: Bolts having atmospheric corrosion resistance and weathering characteristics comparable to that of steel covered in Specifications A242, A588 and A709. ASTM A563 Standard Specification for Carbon and Alloy Steel Nuts This specification covers chemical and mechanical requirements for eight grades of carbon and alloy steel nuts for general structural and mechanical uses on bolts, studs, and other externally threaded parts. Grade A nuts are used for general applications. ASTM A36 Standard Specification for Structural Steel Interchangeable with SAE C1018 Low Carbon, general purpose, special quality machinery steel. This specification covers carbon steel shapes, plates, and bars of structural quality for use in riveted, bolted, or welded construction of bridges and buildings, and for general structural purposes. ASTM A242, A588, and A709 Standard Specifications for High Strength Low Alloy Structural Steels with enhanced atmospheric corrosion resistance. ASTM A536 Ductile Iron Castings This specification covers castings made of ductile iron, also known as spheroidal or nodular iron is used for eyenuts and washer nuts, Grade 65-45-12. ASTM A123 Standard Specification for Zinc (Hot Dip Galvanized) Coatings on Iron and Steel Products This specification covers the requirements for zinc coating (galvanizing) by the hot dip process on iron and steel products made from rolled, pressed and forged shapes, castings, plates, bars and strips. This specification covers both unfabricated products and fabricated products, for example, assembled steel products, structural steel fabrications, large tubes already bent or welded before galvanizing, and wire work fabricated from uncoated steel wire. This specification also covers steel forgings and iron castings incorporated into pieces fabricated before galvanizing or which are too large to be centrifuged (or otherwise handled to remove excess galvanizing bath metal). ANSI/ASME B1.1 Standard for Unified Inch Screw Threads (UN and UNR Thread Form) This specification specifies the thread form, series, class, allowance, tolerance, and designation for unified screw threads. ANSI/ASME B18.2.1 Standard for Square and Hex Bolts and Screws This Standard is intended to cover the complete general and dimensional data for the various types of inch series square and hex bolts and screws. ANSI/ASME B18.5 Standard for Round Head Bolts (Carriage Bolts) This standard covers the complete general and dimensional data for the various types of inch series bolts generally classified as round head bolts. ANSI/ASME B18.15 Standard for Forged Eyebolts This standard is limited to dimensions and capacities for forged threaded eyebolts intended primarily for lifting applications. ANSI C135.1 Standard for galvanized steel bolts and nuts for overhead line construction. This standard covers carriage bolts, machine bolts, double arming bolts, double end bolts, and nuts commonly used in overhead line construction. ANSI C135.2 Standard for threaded galvanized ferrous strand-eye anchor rods and nuts of overhead line construction. ANSI C135.4 Standard for galvanized ferrous eyebolts and nuts for overhead line construction. ANSI C135.5 Standard for galvanized ferrous eyenuts and eyelets for overhead line construction. IFI 136 Standard for Studs and Bent Bolts This standard covers the general and dimensional requirements for various types of studs and bent bolts, including threaded rod, J-bolts, L-bolts, U-bolts, and eyebolts (closed). IFI 128 Standard for Hex Coupling Nuts This standard covers the general and dimensional requirements for hex coupling nuts.